Most of us dream of being our own boss. Working the hours we want, doing something we love and not having to do something we don't particularly like just to receive a salary every month. Now think for a moment; what does that sound like? Okay I'll tell you; retirement. Think about it, this is time of life when the majority of us finally achieve that goal of being our own boss without having any demands made on our time. These business ecards are the perfect one to send somebody who is retiring but doesn't seem particularly pleased about having all that time on their hands. The image is of a seashore at sunset with a deserted jetty reaching out into the sea until it disappears. 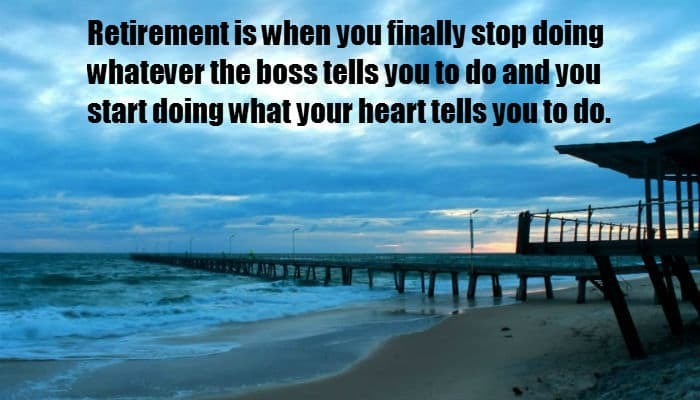 The profound message reads “Retirement is when you finally stop doing whatever the boss tells you to do and you start doing what your heart tells you to do”. A simple enough message that perfectly sums up what retirement is all about. You can add your own personal message as well if you want to reiterate on the message already there or simply add you name as those words have said it all for you. We would love the opportunity for you to try our corporate holiday ecards this coming holiday season and we promise you won’t look back.